3 total results were found for this item. Ordered by high price to low price. 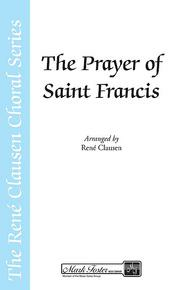 Prayer of St. Francis composed by RenÃ© Clausen and Ren. For Choral (SATB). Mark Foster. 12 pages. Shawnee Press #MF2087. Published by Shawnee Press (HL.35017368). Prayer of St. Francis composed by Ed Harris. For SATB choir. Sacred, Commitment, General. Octavo. Published by Hope Publishing Company (HP.K108416). 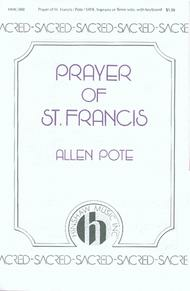 Prayer Of St Francis composed by Allen Pote. For SATB choir, Soprano or Tenor soloist and piano accompaniment (keyboard accompaniment). Choral. Medium Easy Adult. Sacred. Difficulty: Medium Easy (Adult). Octavo. 8 pages. Duration 3 minutes, 57 seconds. 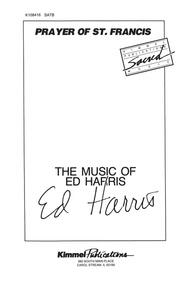 Published by Hinshaw Music Inc. (HI.HMC888).